Imagine a casual stroll thru a quiet and beautifully illuminated garden of vividly colored flowers along the peaceful shoreline of one of the most breathtaking mountain lake’s you’ve ever seen. Then picture yourself looking out across a broad horizon where glorious mountains seem to rise out of the depths of the shimmering blue waters of the lake itself, crowned by a sea of rich blue skies filled with puffy white clouds. Sounds like a dream, well it is, a waking dream available to anyone that visits the Hamilton Gardens at the fairgrounds. Hamilton Gardens is located in a wooded park like setting along a shoreline section of Lake Chatuge and contains one of the largest collections of hybrid Rhododendrons in the state of Georgia. Lining a mile-long trail of pine-bark are more than 3,000 plants, blooming from early April to late May. When in bloom this is one of the finest displays of Rhododendrons anywhere in the world. This public park and garden is maintained by the local Lions Club and cherished by all those that work and visit the gardens regularly. 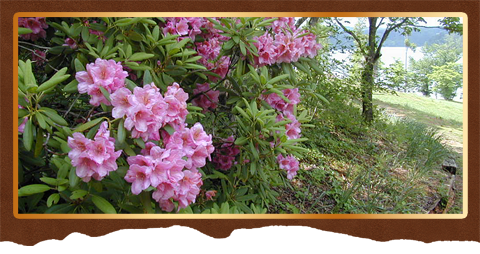 Rhododendrons, Azaleas and other plants are for sale at the gardens during festivals. Hours are 8:00 a.m. to 7:00 p.m.